This year I am only growing two types of cucumber, and I almost didn’t grow these at all. I was late sowing and was so busy with everything else that I didn’t get round to sowing them. Then I suddenly remembered in late May and thought I had better sow a few. One is ‘Carmen’, an all-female, F1 cue. All-female cucumbers are the easiest to grow because there are no male flowers to pollinate the female flowers – which makes them swollen and bitter – and they are usually more resistant to disease. 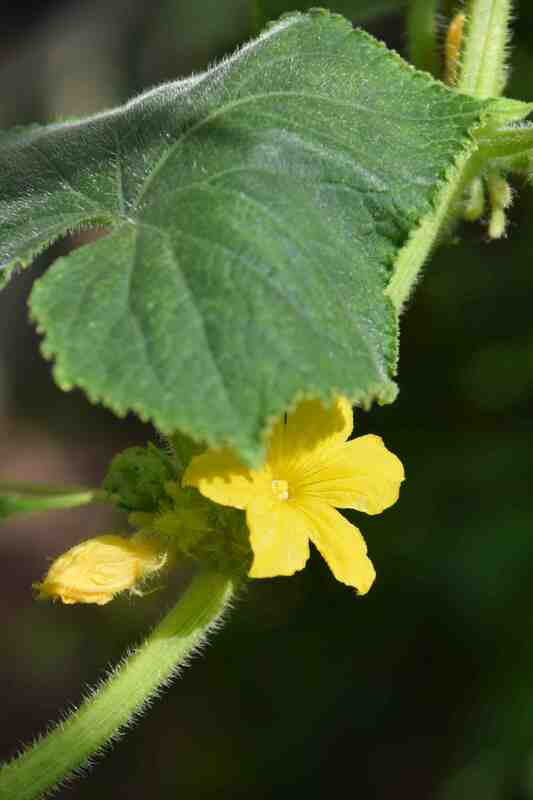 Cucumbers are odd in that the fruits are parthenocarpic – they are formed without the flowers being pollinated. 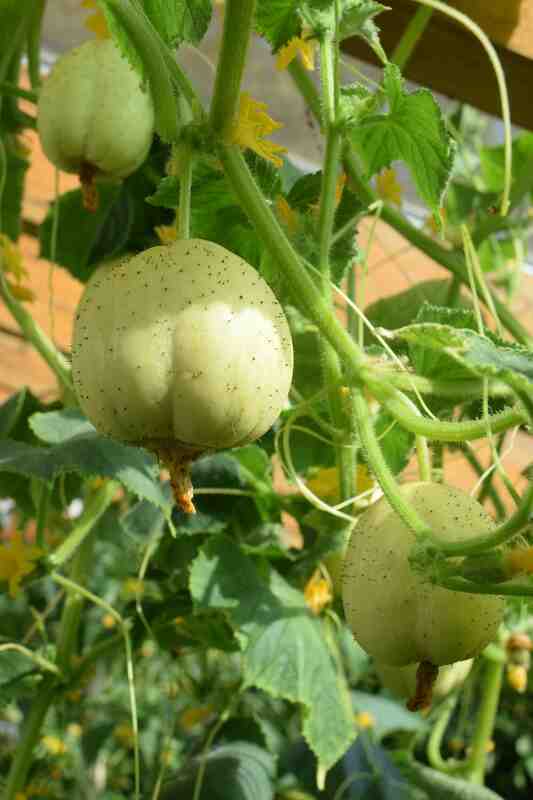 ‘Carmen’ is a good variety with long, attractive fruit and is often grown for showing. It crops well and it is just like a good supermarket cue (only without the plastic). All-female cucumbers can produce male flowers if the plants are stressed so keep them growing steadily. You may be wondering how you stress a cucumber – make it suffer from extremes of temperature, drought or lack of food – it really isn’t a joke. It is important to grow only all-female cucumbers in your greenhouse or male flowers on other plants will produce pollen that bees will carry to your all-female plant. The other cucumber I am growing is ‘Crystal Apple’. This is a very different plant altogether. The most important difference, though not the most obvious by looking at it, is that this is like ‘ridge’ or outdoor cucumbers and gherkins, and this one needs its female flowers to be pollinated to form a fruit. So the male and female flowers are left on the plant. As with many cucurbits, plants tend to produce only male flowers at first but eventually I had some female flowers and now the plant is carrying many fruits. ‘Crystal Apple’ produces globular, white fruits, with sparse black bristles and once they start to crop they are usually prolific. 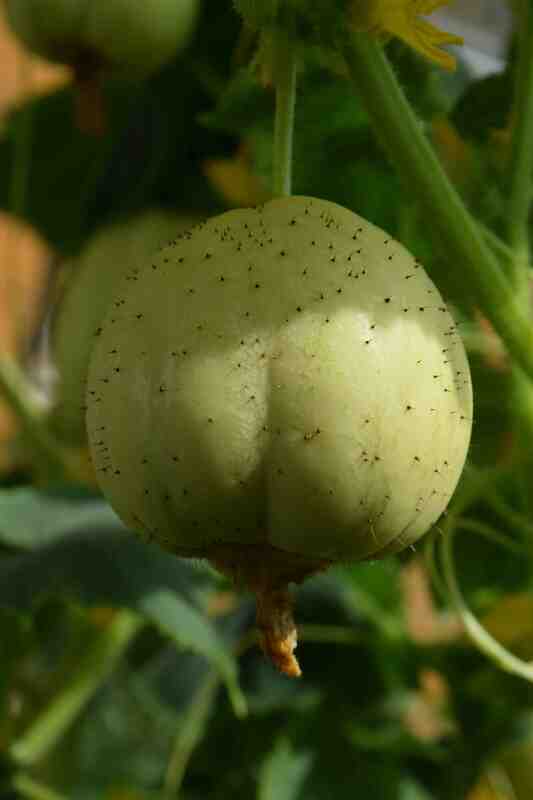 The fruits are very tasty but have larger seeds and seed cavity than ‘normal’ cues. They are crisp and white-fleshed but they do need peeling! As they mature they start to turn yellow and you should avoid letting them get to this stage because they can be bitter by then. They can be grown outside, in a sunny, sheltered spot, or in the greenhouse. In general they are easier to grow than ‘normal’ cues but make sure they have enough water – and of course they must be protected from frost when young. I sow them, like all my squash, singly, on their sides, in multipurpose compost in 8-10cm pots in mid-late April (usually). They are ideal for growing in pots on the patio and are a good crop for kids because they grow quickly, are a bit weird and they taste nice. The plants will reach about 1m or more high and will scramble widely and need support. Although they may not have the refinement of long green cues they are very useful. When small, they could be stuffed (a filling of prawn cocktail would be nice – if you remember to peel them – the cues and the prawns), they are good for pickling and for salads and also for cooking, such as cucumber soup. So far I have just eaten them raw! You do grow such a varied and interesting selection of Veg. It’s an encouragement to us all to be a bit more adventurous in our chices. Thank you, and keep it up! I have a few more veg from this year to post about. The squashes are just about ready so they will be next. I like to experiment when I can but try to be as honest as possible about how they grow, though sometimes when something fails it is not always the plant’s fault – but mine. Enjoyed reading this. I too grow strange and unusual things. Another blogger from New Zealand informed me they call them crystal apples there, too what we call “heirloom lemon cucumbers”…great post and very educational! I guess that is why my cukes I grew on an arbor, vertically this year were loaded with bees..did not know that about male + female etc. it is funny how a lot of our vegetables have different names,but they look alike or similar since they do adapt to where they are grown:-) I never knew yours was the same as ours. Your photo really captured it and it was the same!